On Saturday afternoon, July 21st, the world’s best and undefeated cruiserweights, Oleksandr Uysk and Murat Gassiev, will battle for four world titles and the bragging rights to be crowned the undisputed World Cruiserweight Champ. Both fighters possess perfect undefeated records, tremendous explosive power, and with the winner taking all the major recognized belts, this is the must-watch Cruiserweight battle of the year. This amazing showdown featuring Usyk v Gassiev for the undisputed Cruiserweight championship and will air live and exclusively on KlowdTV in the United States. Usyk (14-0, 11 KOs) of Kiev, Ukraine is WBC and WBO world cruiserweight champion. The 2012 Olympic Gold Medal winner won the WBO world title with a 12-round unanimous decision over Krzysztof Glowacki on September 17, 2016 in Poland. Usyk defended the title twice with a 9th round stoppage over Thabiso Mchunu and a 12-round unanimous decision over Michael Hunter. Usyk scored a 10th round stoppage over former world champion Marco Huck. In his latest bout, Usyk captured the WBC World Cruiserweight title with a majority decision over Mairis Briedis on January 27th in Latvia. Gassiev (26-0, 19 KOs) of Russia, is the IBF and WBA Super Cruiserweight champion. Gassiev now trains in Big Bear, California under famed trainer Abel Sanchez. The 24-year-old Gassiev won IBF championship on December 3, 2016 with a 12-round unanimous decision over Denis Lebedev. Gassiev registered a 3rd round destruction of former world champion Krzysztof Wlodarczyk. In his last bout, Gassiev won the WBA World Super Cruiserweight title with a 12th round stoppage over previously undefeated Yunier Dorticos on February 3, 2018. KlowdTV is your 24/7 live streaming service, featuring over 30 live channels plus 50 music channels. The fight is free to KlowdTV subscribers. New subscribers can enjoy the fight for the $9.99/month subscription fee, which includes numerous live channels including Fight Network, GolTV, FNTSY Sports Network, Pursuit Channel, Sony Movie Channel and more. Simply visit www.klowdtv.com to enjoy this “can’t-miss” fight and 30 days of KlowdTV for just $9.99 per month. KlowdTV can be accessed on any device that includes Smart TV’s, computers, ROKU, Amazon, Android and iOS phones and tablets. Canadian boxing fans will be able to watch the much-anticipated World Boxing Super Series (WBSS) cruiserweight championship finale this Saturday afternoon, as they have throughout the wildly entertaining semifinals and quarterfinals rounds, exclusively on Super Channel. All four-major sanctioning body world title belts, plus The Ring magazine’s strap, will be on the line at the Olympic Sport Complex in Moscow, when WBC/WBO champion Oleksandr “The Cat” Usyk (14-0, 11 KOs) and IBF/WBA title-holder Murat Gassiev (26-0, 19 KOs) square off for the inaugural Muhammad Ali Trophy, in addition to determining the first totally unified cruiserweight champion in the world in what is a legitimate Fight of the Year candidate. 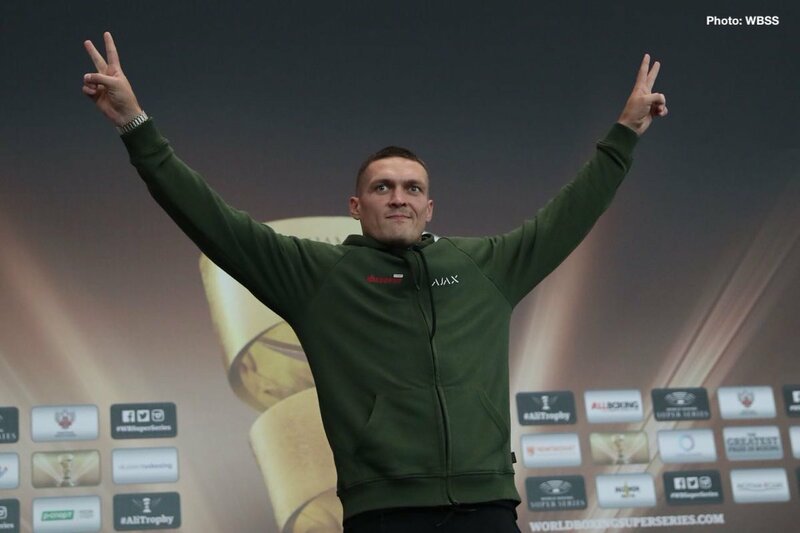 The 31-year-old Usyk, the 2012 Olympic gold medalist from Ukraine, stopped Marco Huck in the 10th round of their WBSS quarterfinal match, and he won a 12-round unanimous decision over Mairis Briedis in the semifinals. Russia-native Gassiev, 24, knocked out Krzysctof Wlodarczyk and Yunier Dorticos, respectively, in the third and 12th round of the quarterfinals and semifinals. “He (Gassiev) is a strong guy,” Usyk said, “And now, thank God, Murat and I will fight for the Muhammad Ali Trophy and the absolute world champion’ title. “I feel excellent about (fighting in Russia) it. I am an athlete, a warrior. I do not care where I fight, I just want to fight. I know there will be support coming in from Ukraine which is great. I am ready, my team is ready. When the strong guys meet, the fights are interesting! This is what is so great about this tournament. It is necessary for the sport. I have said it before and I will say it again: the fans should expect a beautiful final. “The training camp before the final has been the same as before my other fights,” Gassiev commented. “My opponent is a southpaw, so I have had different sparring partners and you have to do things a bit different tactically against a southpaw. But, besides that nothing has changed. “I have been doing the same amount of running, physical exercising and sparring. I am not thinking about what he is doing. I need to be Murat Gassiev and do my best… I am only thinking about myself, my skills and my condition. That’s it. Four potentially explosive fights are on the “Usyk vs. Gassiev” card, presented by Patriot Boxing Promotions, airing exclusively in Canada on Super Channel. All WBSS fights will also be available on Super Channel On Demand. The postponed WBSS world super middleweight champion final hasn’t been rescheduled at this time. In addition to all the WBSS quarterfinal and semifinals matches, Super Channel aired major boxing events live the past 1 ½ years including Brook vs. Spence Jr., Pacquiao-Horn, Eubank, Jr. vs. Abraham, Lomachenko vs.Marriaga, Crawford vs. Indongo, Smith vs. Williams II, Frampton vs. Donaire, and Fury vs Seferi. To watch the World Boxing Super Series cruiserweight championship final live, as well as more exciting boxing to come in 2018, fight fans in Canada may contact their local cable provider to subscribe to Super Channel and all that it offers, including premium series, movies and much more, for as low as $9.95 per month.